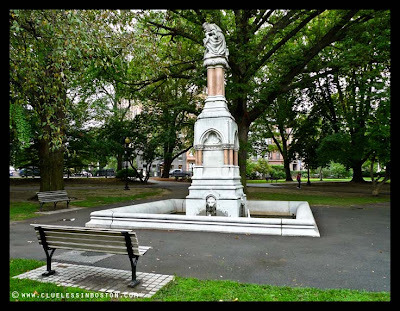 The monument was commissioned by Thomas Lee and commemorates the discovery ether and its use as an anesthetic in surgery performed at Massachusetts General Hospital October 16, 1846. The fountain was designed by John Quincy Adams Ward and Henry Van Brunt. In the center of a large square fountain basin is a tall square granite base topped with a sculpture depicting a bearded man in robe and turban (the good samaritan) attending a wounded reclining male figure who appears unconscious. Around the center section of the base, there is an inscription panel on each side. The inscription panels are bordered by a decorative frieze, flanked by pairs of polished red granite columns, and topped with a small tre-foil shaped marble relief. The relief on the front depicts the performance of surgery; the relief on the right depicts an allegory of the triumph of science; the relief on the rear depicts a field hospital with a wounded soldier in the care of a surgeon; and the relief on the left depicts the Angel of Mercy descending toward a reclining figure. A water spout on each side of the base is designed as a lion head. An awful lot of symbolism in it. Well, today they would just have a steel girder going through a slab of concrete with a little plaque on the ground nearby,lol. It.s nice!